Grids are UI elements designed for layouting other elements. Grids are created using OSGridCreate. A grid has two dimensions: the number of columns, and the number of rows. Each cell in the grid can either be empty or contain one child element. Child elements are added using OSGridAddElement. Each element has an additional layout field which determines how it will be laid out. A grid can have a border. This is a space between the 4 sides of the grid's boundaries and the area in which elements will be placed. A grid can also keep elements spaced apart using a constant gap between columns and rows. Some grids have a background image. Each column in the grid can have a different width, and each row in the grid can have a different height. This is an example of 2x2 grid. This grid has a small border on each side, and a slightly smaller gap size. It has a background color, which makes it ideal for the placement of controls like labels. Each row has the same height, but the second column (index 1) has a greater width than the first column (index 0). Grids use a simple algorithm for layouting, which occurs when it receives a OS_MESSAGE_LAYOUT message. First, it measures the size of each element by sending each a OS_MESSAGE_MEASURE message. It finds the widest element in each column, and makes that the width of the column. It finds the tallest element in each row, and makes that the height of the row. Each element is then sent their bounds through a OS_MESSAGE_LAYOUT message. There are a few complications to this however. Each element has an additional layout field which determines what happens when the cell bounds it receives are greater than its preferred size. The layout field is a combination of OS_CELL_ flags. It's common to want an element to fill as much of its parent element as possible, so that when the window is resized its contents will match the new size. 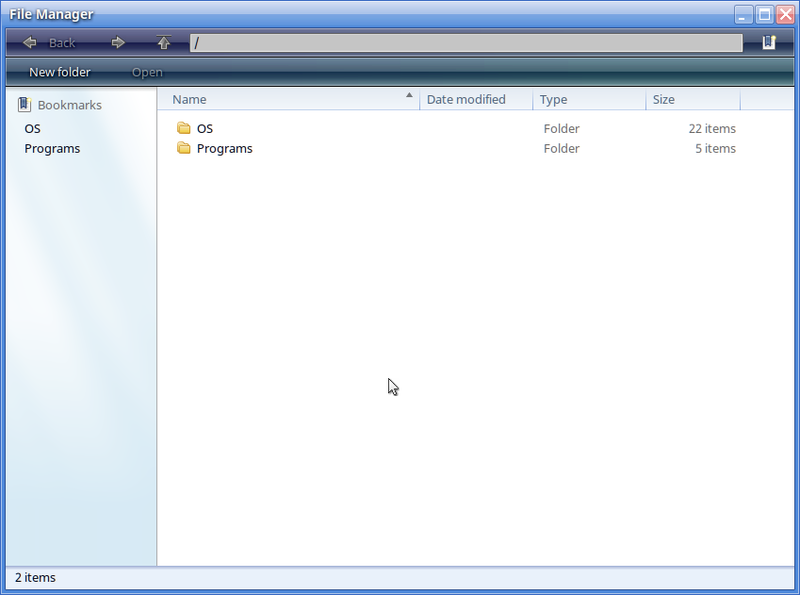 In this image of the file manager we can see that the toolbars at the top and the status bar at the bottom fill the horizontal width of the window, the path textbox fills the remaining horizontal width of the first toolbar, the bookmarks list fills the remaining vertical height of the window, and the folder listing fills the rest of the window. This is done using the push layout flags. After the non-pushed columns and rows have been sized, the remaining space will be divided up equally among all the pushed columns and rows. 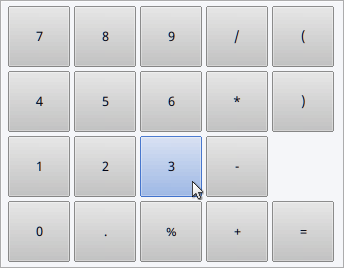 In the calculator all of the buttons use the flags OS_CELL_H_PUSH | OS_CELL_V_PUSH | OS_CELL_H_EXPAND | OS_CELL_V_EXPAND. Therefore they evenly divide up all the space in the window. Note that the expand flags are still necessary; the push flags affect the size of the cells rather than the preferred size of the elements. Add an element to a grid, at a given column and row, and using a given layout. The cell must not be occupied. Create a grid with a given number of columns and rows. bool noclip; // Don't clip children.